WCR: Delay Decisions with Cool Diversions — Stay Cool, Mom. I hope you had a good weekend. While working on some pumpkin masterpieces, Teddy made a unexpected pronouncement that he doesn't want to re-wear his Batman costume from last year (which he's insisted on for the past month) and, instead, wants to be.... an iguana. Help me out here, when's the cutoff for costume changes? I mean, we're a week out. My strategy for mom decisions is to wait until the last possible minute. It's in that spirit that I'm sharing some fun things happening on planet Earth this week. No decisions necessary. Just sit back and absorb. ART: The Obama's picked artists for their official portraits to be hung in the Smithsonian's National Portrait Gallery. 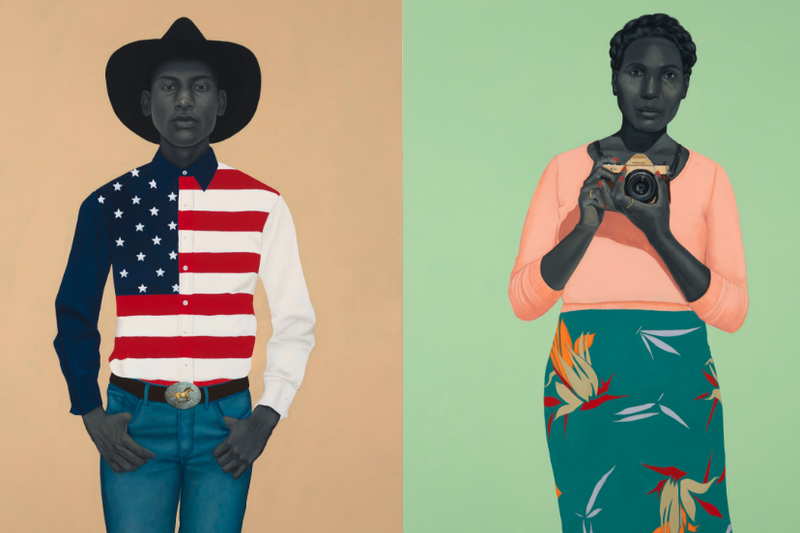 For Michelle, it's Amy Sherald, who makes portraits that often speak to social issues, like race and gender-identity. For Barack, it's Kehinde Wiley, who does large-scale history paintings with Black subjects. Wiley's famous portrait of Ice-T, after Jacques Louis David's Napoleon. Perfect choices, right? I bet they'll be beautiful. MUSIC: Ok, I'm a few weeks late in hearing this, so, apologies if you its old news but I'm serious this Miley Cyrus is for real gritty and good. People are saying the album (Younger Now) isn't great but I like the sound of that one. It's a bit of a rip off of my fave badass dream woman, Neko Case, I think, no? BTW, if you don't own Middle Cyclone, buy it NOW! It's BFF material. LIT: I liked this short profile on Chimamanda Ngozi Adichi by Dave Eggers from the NYTimes. Comes out November 17, but you can pre-order on Amazon. Author Keeanga-Yamahtta Taylor interviews various members of the 1960's radical black feminist group, the Combahee River Collective, in an attempt to inform current Black activist movements. FASHION: If you missed my post about the best matte lips for fall, go get it here. I used all of your suggestions, thanks!! There! I hope that was at least 5 minutes responsibility-free!! If you need a little more, check out DJ Prince on Instagram. He's my latest obsession, thanks sister Em. Cover photo is It Made Sense Mostly in Her Mind by Amy Sherald.